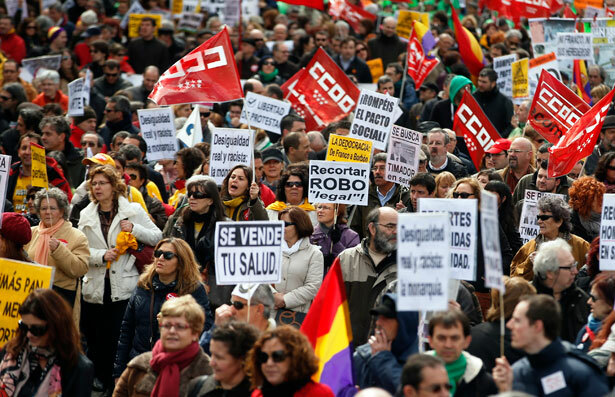 Tens of thousands of austerity opponents took to the streets in Spain, Greece and Portugal this month. Tens of thousands of protesters flooded the streets of Spain and Greece this week in response to ongoing budget cuts and high unemployment. In Spain, unemployment has passed the 5 million mark for the first time since records began—attracting widespread criticism over the conservative government’s austerity plans. Similarly, Greece, which has served as a laboratory for austerity enthusiasts, has suffered mass poverty, unemployment and suicide since severe budget cuts were implemented by the government. “Poverty, unemployment, suicides. Enough is enough,” was the slogan chanted on Syntagma square by some 1,500 Greek demonstrators non-affiliated with political parties who were mobilized through social media. The demonstration ended when police shot tear gas at protesters—a police tactic also used during the anti-austerity demonstrations in Athens when the debt crisis began in late 2009. There has been a sharp rise in the number of suicides in Greece since the beginning of the crisis in 2009, with official sources putting the figure at over 3,100 from the start of 2009 to August 2012, though experts say that deaths by suicide are often not documented as such because of the social stigma attached to them. On Saturday, Greek Prime Minister Antonis Samaras promised that there would be “no more austerity measures” as international creditors prolonged an audit of crisis reforms. “There will be no more austerity measures,” Samaras said in a televised speech to his conservative party’s political committee. “And as soon as growth sets in, relief measures will slowly begin,” Samaras said. However, it seems unlikely Samaras will have the last word on budget cuts, and auditors have made it clear they expect to see an increase in privatization plans. Under the bailout conditions adopted last year, Greece needs to cut public sector workers by 25,000 in 2013 and a total of 150,000 by the end of 2015. In Spain, the Madrid protest ended when police fired tear gas at protesters and arrested forty-five people, including nine minors. Reportedly, forty people were injured during the protest, and police claim they found four firebombs in a backpack abandoned on a street, in addition to twenty-two firecrackers, five flares and a stick from two minors near Madrid’s main railway station. The AP reports that rallies were organized in Madrid and sixty other cities by 150 organizations, including trade unions representing the construction, car and television industries as well as police and health services. Police estimated some 20,000 people marched in Barcelona, but authorities did not have figures for a large rally held in Madrid. Protesters marched to the Spanish parliament in opposition to tax hikes, spending cuts, high unemployment and alleged corruption. At the tail end of the demonstrations, young protesters threw bar chairs into a road and burned garbage containers. At the beginning of the month, many thousands of demonstrators held marches in more than twenty cities in Portugal to protest against austerity measures. Tens of thousands filled a Lisbon boulevard during the protests and headed to the finance ministry carrying placards that read, “Screw the troika, we want our lives back.” The troika is a slang term for the three organizations which have the most power over debt-ridden countries’ financial futures: the European Commission, the International Monetary Fund and the European Central Bank. Protesters can be heard in the video below singing a song linked to a 1974 popular uprising known as the Carnation Revolution—named because no shots were fired when the population started descending the streets to celebrate the end of Marcello Caetano’s reign; instead protesters placed carnation flowers into the muzzles of rifles and on the uniforms of the army. Portugal is expected to suffer a third straight year of recession in 2013, and the overall jobless rate has grown to a record 17.6 percent—of which young people are a particularly devastated demographic with unemployment close to 40 percent. It’s time to reclaim labor rights as an American ideal, John Nichols writes.